South Carolina native Kathryn George Frost, a retired Army Major General and wife of former Democratic Reprsentative Martin Frost of Texas, died Friday, August 18, 2006, after a four-year battle with breast cancer. She was 57. Frost, a two-star general, was the highest-ranking woman in the U.S. Army when she retired last year after a 31-year career. "Kathy was a woman of incredible strength. She inspired not only women, but everyone she met. Her strength and courage, though, were tempered by her love and devotion. I will miss her deeply," Martin Frost said in a statement. Kathryn Frost finished her career as commander of the Army and Air Force Exchange Service, which operates the commissaries and post and base exchanges on military installations nationally and overseas. Martin Frost said his wife established base and post exchanges in Afghanistan and Iraq. The AAFES received a reward from the National Retail Federation for its work in the war zones while Kathryn Frost served as commander. "General Frost is a fine role model for soldiers and Army leaders," said Army spokesman Paul Boyce. "She was well known for her work to champion personnel policies, education and leadership innovations for the U.S. Army. She will certainly be missed by those who worked with her and those who benefited from her expertise and vision." Before serving as commander of AAFES, Frost served four years as the Army Adjutant General and commander of the Eastern Sector of the Military Entrance Processing Command. She worked in Berlin on the staff of then-General Colin Powell when he was Chairman of the Joint Chiefs of Staff. Frost also worked as a White House social aide during the administrations of President Reagan and the first President Bush. Martin Frost was a 26-year congressman who lost his 2004 re-election bid after Texas' congressional districts were redrawn. The Frosts were married in August 1998 in the U.S. Capitol. The Frosts moved from Dallas to Washington last year to be near Walter Reed Army Medical Center, where Kathryn was undergoing treatment. Earlier this year, the couple bought Kathryn's childhood home in Latta, South Carolina. Frost was valedictorian of her high school in 1967 and graduated with honors from University of South Carolina in 1970. She earned a master's in counseling at Wayne State University in Michigan while on active duty with the Army. Along with her husband, Frost is survived by three stepdaughters. Burial at Arlington National Cemetery has not been scheduled. The family asked that expressions of sympathy be sent as contributions to the Latta United Methodist Church or Latta High School. Retired Army Major General Kathryn George Frost, the wife of former U.S. Representative Martin Frost, D-Dallas, died Friday after a four-year battle with breast cancer. General Frost, who commanded the Army and Air Force Exchange Service in Dallas during her final service assignment, was 57. The AAFES is an $8 billion operation that provides retail goods to U.S. troops worldwide. As AAFES commander, General Frost was responsible for establishing post exchanges and base exchanges in Afghanistan and Iraq after U.S. troops deployed there in 2001 and 2003. "Providing support to our troops…is the most important job we’ll ever do,” General Frost told the American Forces Press Service in January 2004. Born Kathryn George on November 7, 1948, in Dillon County, South Carolina, she graduated from the University of South Carolina in 1970 with a degree in library science. She joined the Army in 1974 after working three years as a civilian employee in Army education. While in the Army, she earned a master’s degree in counseling from Wayne State University in Michigan. Her military career included several prominent assignments. In the 1980s, she was a social aide at the White House for both President Ronald Reagan and President George Bush. During the 1991 Gulf War, General Frost was on the legislative liaison staff of Gen. Colin Powell, chairman of the Joint Chiefs of Staff. She was adjutant general of the Army on September 11, 2001, when a plane hijacked by al Qaeda terrorists hit the Pentagon, killing her boss - Army Lieutenant General Timothy J. Maude, deputy chief of staff for personnel - and two of General Frost’s aides, Mr. Frost said. "The point of impact of the plane was in her boss’s office,” Mr. Frost said. General Frost’s office was in another building, but she had been invited to a meeting that morning in General Maude’s office. Gen. Frost had a conflicting appointment that kept her from attending. Mr. Frost, at the time a senior member of the Democratic minority in the House, quickly decided that his interest in the general went beyond professional matters and “asked my staff to arrange times to see her again at official functions,” he recalled. She spoke at his annual procurement conference at the University of Texas at Arlington and was a member of his committee that reviewed applications for appointments to the military academies. Finally, “I asked for an appointment to come by and see her at her office and told her that I would be interested in asking her out,” Mr. Frost said. They were married in August 1998 in the prayer room of the U.S. Capitol with the House chaplain performing the ceremony. General Frost was diagnosed with breast cancer a month before she assumed command of AAFES in August 2002, Mr. Frost said. "She had a mastectomy and reported for duty on time,” he said. She also underwent chemotherapy while AAFES commander. General Frost was to become executive director of the American Association of University Women, but her illness prevented her from taking the post. Besides her husband, Gen. Frost is survived by her sister, Gwen Strickland, of Marion, South Carolina; stepdaughters Alanna Bach of El Paso, Mariel Sala of Fort Worth and Camille Frost of Santa Fe, New Mexico; three step-granddaughters; a nephew; and numerous cousins. After a memorial service in South Carolina, burial will be in Arlington Cemetery in Washington. Texans wishing to make contributions in her memory are asked to send them to the Harold C. Simmons Comprehensive Cancer Center at the University of Texas Southwestern or to the AAFES Retired Employee Scholarship Fund in Dallas. 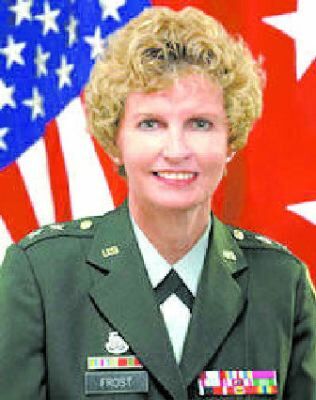 Funeral services for retired Army Major General Kathryn Frost, 57, former commander of the Army and Air Force Exchange Service, will be held September 15, 2006, at the chapel at Fort Myer, Virgijnia. She will be buried with full military honors at Arlington National Cemetery. Frost died August 18, 2006, after a four-year battle with breast cancer. When she retired from the Army in 2005 after 31 years of service, Frost was the highest ranking woman in the Army. Under her watch, AAFES was ranked third out of 20 retail stores for consumer electronics by Consumer Reports; and was named textile retailer of the year and International Franchiser of the Year by Popeye’s Corporation. Frost was insistent about bringing AAFES stores into Iraq and Afghanistan as quickly as possible to serve the troops. “No, it’s a little bit of heaven,” he replied. After graduating Phi Beta Kappa from the University of South Carolina, Frost entered the Women’s Army Corps in 1974. She rose through the ranks in the Army, and prior to being named commander of AAFES, she served as Army adjutant general, responsible for casualty notifications and assistance program after September 11, 2001, among many other duties. Frost died in Latta, South Carolina, where she grew up. She is survived by her husband, former Representative Martin Frost, her sister, Gwen Strickland of Marion, South Carolina, three stepdaughters, and three granddaughters.